You don't have to buy packaged, processed junk food for your next road trip! 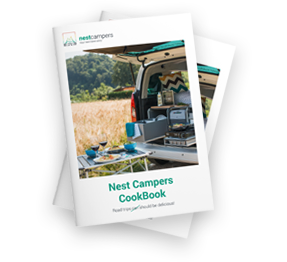 These simple lunch and dinner recipes are healthy, easy to make and delicious and all our campervans are fully equipped with necessary kitchenware. There is a great dessert at the end of the list as well, make sure to try that one! Epic road trips require epic food! It’s always important to stay healthy while on the road and there is nothing healthier than a good old salad. Drain the green lentils, add to a pot and cover with water (add some salt as well). Bring to the boil then simmer for 15-20 minutes or until soft. Once the lentils are cooked, drain them and add to a bowl. Add chopped cherry tomatoes, red onion, cucumber and baby spinach or rocket salad. Grill the cheese. Mix the olive oil, white wine vinegar, the juice from 1 lemon and salt and pepper to taste. You can also add spices or your favourite dressing ingredients at this point. Mix the dressing, lentils and fresh vegetable. Put the grilled cheese on the top of this delicious salad and enjoy! Fast and easy Thai red curry with coconut milk is loaded with exotic flavours. Cook the rice and set aside. Warm the skillet, add some oil and onion and stir until the onion has softened and is turning translucent. Add the ginger and garlic and cook until fragrant, about 30 seconds, while stirring continuously. Add the bell peppers, carrots and other veggies (if you’re doing a chicken version, put the chicken first). Cook until they are fork-tender and then add the curry paste and cook, stirring often, for 2 minutes. Add the coconut milk, water and sugar, and stir to combine. Bring the mixture to a simmer over medium heat. Reduce heat as necessary to maintain a gentle simmer and cook until the vegetables have softened to your liking, about 5 to 10 minutes, stirring occasionally. Remove the pot from the heat and season with tamari and rice vinegar if you have some. Add salt to taste. Divide rice and curry into bowls and garnish with lime, chopped cilantro and a sprinkle of red pepper flakes. Warm olive oil in a pan, add and cook onion until it’s tender. Add minced beef, season with salt and pepper and cook for 5 minutes or until beef is cooked. Add peppers, kidney beans, corn, spices and herbs and stir for few minutes. Add chopped tomato and tomato puree and stir until tomato is tender, after that let it simmer for 10 more minutes. Tip couscous into a large bowl, pour over stock. Cover, then leave for 10 mins, until fluffy and all the stock has been absorbed. Meanwhile, slice the onions and pepper and dice the cucumber. Add these to the couscous, fork through pesto and mint, crumble in feta, then sprinkle over pine nuts to serve. A classic Italian dish which is quick to make and easy to master. In a large pot of boiling salted water, cook pasta according to package instructions; reserve 1/2 cup of pasta water and drain well. In a small bowl, whisk together eggs and Parmesan; set aside. Heat a large skillet over medium high heat. Add bacon and cook until brown and crispy, about 6-8 minutes; reserve excess fat. Stir in garlic until fragrant, about 1 minute. Reduce heat to low. Working quickly, stir in pasta and egg mixture, and gently toss to combine; season with salt and pepper, to taste. Add reserved pasta water, one tablespoon at a time, until desired consistency is reached. Pat the chicken breasts dry. On each side of the chicken breasts make three slits through. Spread the garlic on both sides; insert some garlic into the slits you made. Season the chicken breasts on both sides with salt, pepper and 1/2 of the dried oregano. In a large cast iron skillet, heat 2 tbsp of olive oil on medium-high. Brown the chicken on both sides. Add the white wine and let reduce by 1/2 then add the lemon juice and chicken broth. Sprinkle the remaining oregano on top. Reduce the heat to medium. Cover with a lid or tightly with foil. Cook for 10-15 mins turning the chicken over once. Uncover and top with the chopped onions, tomatoes and olives. Cover again and cook for only 3 minutes. Finally add the parsley and feta cheese. Serve with a light pasta, rice or couscous. Enjoy! Quick and easy gourmet dish that requires almost no cleaning up! Season salmon filets with sea salt and fresh cracked black pepper. Spread 1 tbsp of dijon mustard on the tops of each salmon filets. Layer 2 lemon slices, a sprig of tarragon and dill, a few slices of shallot, 1 tbsp of butter, and some garlic on each salmon filet. Splash the tops of the filets with a big gulp of olive oil. Wrap salmon filets individually in tin foil and put tin foil wrapped salmon directly in fire. Cook for 6-8 minutes, or until fish is cooked. Cook instant polenta in salted water according to the instructions on the label, it usually takes 5 minutes for it to cook (water:polenta ratio is usually 3:1), stir all the time! Once polenta is cooked, a generous knob of butter and a handful of grated parmesan can be added to make it extra creamy. You can also season it with oregano, black pepper or other seasoning to your liking etc. If you have dried mushrooms: place the dried mushrooms in a medium bowl, cover with hot water, and let sit until soft, about 10 minutes. Drain the mushrooms and reserve the liquid, roughly chop the mushrooms and set aside. Heat the oil or butter in a large skillet over medium heat. Add the onion and cook, stirring, until soft and fragrant, about 2 minutes. Add the garlic and cook, stirring, until fragrant, 30 seconds. Add the chopped mushrooms and quartered button mushrooms, and cook, stirring, for 2 minutes. Add the reserved mushroom liquid, bring to a boil, and cook, stirring occasionally, until the liquid is nearly all evaporated, 1 to 1 1/2 minutes. Add the cream, thyme, salt, and pepper and return to a simmer. Cook, stirring occasionally, until the cream is reduced and thick, 4 to 5 minutes. Add the parsley and stir to incorporate. Serve the sauce over the polenta and enjoy! Wash the salad greens and put them in a bowl. Arrange the pear slices evenly over the greens then scatter the walnuts/cashews over. Last but not least, crumble the blue cheese over top. Make the vinaigrette by mixing all the ingredients together, just put it all in a jar and shook it up. Easy! Pour over the salad and serve. Make sure you get some before everyone else gets their greedy little hands on it. Make a lengthwise cut across the longest part of the banana in the center. Fill each banana opening with chocolate and marshmallows (if you have them). Place each banana in a foil packet. Cook directly on a low-flame fire or over the grill for 8-10 minutes until you see the marshmallow and chocolate melt throughout and bananas are soft and caramelised. By the way, don’t be alarmed when the banana peel turns black. You won’t be eating the banana peel and it’s a natural effect.